Vincent Van Gogh’s life was a short one but almost three years of it were spent in Britain. A big new exhibition at Tate Britain in London brings together 50 of his pictures – including some masterpieces – to show how life in the capital and the art scene in Britain – influenced the young artist. And how he in turn influenced British artists such as Francis Bacon. You wouldn’t normally visit a major show of work by Van Gogh to find yourself surrounded in the first rooms by paintings and engravings by the likes of James Whistler, Sir John Millais and Gustave Doré. But the new exhibition Van Gogh and Britain is all about context. The best known pictures include l’Arlesienne and his Sunflowers of 1888, which normally hangs in the National Gallery in London. 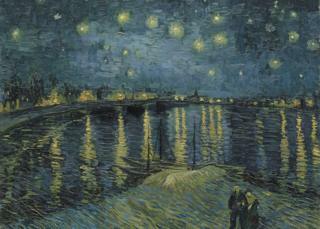 The Musée d’Orsay in Paris has loaned Starry Night Over the Rhone, one of the artist’s most spectacular images. Alex Farquharson, the director of Tate Britain, says the years in London had a huge effect on the artist-to-be. “I think Vincent found his university education in London. “He would walk everywhere and went to places like the National Gallery and the Dulwich Picture Gallery. We’ve even borrowed the Dulwich visitors book which has his signature in. For most of his time in London, Van Gogh lodged at 87 Hackford Road, at the home of Ursula Loyer and her daughter Eugenie. Since 1973 there’s been a blue plaque there to his memory. In 2003, Nicholas Wright’s stage-play Vincent in Brixton – a hit in London and on Broadway – drew attention to a part of the artist’s life which few had previously known much about. Farquharson says prints and engravings – perhaps at their most vibrant in the Victorian era – were a huge influence. “There’s a print which Gustave Doré did of prisoners in Newgate debtors jail in London. 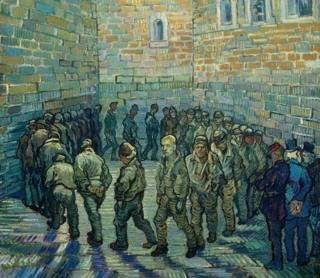 Near the end of his life Van Gogh made a strikingly similar image, though in colour, called The Prison Courtyard (normally hanging in the Pushkin Museum in Moscow). 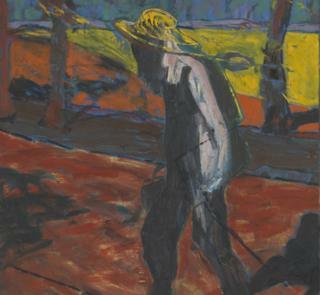 The last rooms of the show turn to Van Gogh’s influence on artists who came after him. A turning point was the exhibition in 1910 at the Grafton Galleries in Mayfair. 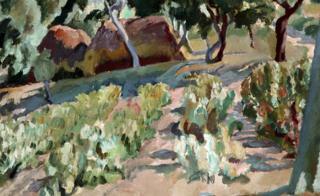 The critic Roger Fry had organised an exhibition of Post-Impressionist work which introduced Van Gogh’s work to many art lovers who had barely known his name since his suicide near Paris 20 years before. The Tate show also includes some of the press reaction to Van Gogh’s work in Edwardian England, some of which now appears shockingly cruel. You see how the crude caricature emerged of a mad Dutchman who sliced his own ear off. “You always have to remember that when Vincent Van Gogh died he was known to almost no one in Britain. His first solo show wasn’t until 1922 and then came the milestone of the major Tate Gallery exhibition in 1947. Among the most striking works on display by other artists are Francis Bacon’s Studies For A Portrait Of Van Gogh (1957). They were based on photographs of Van Gogh’s The Painter on the Road to Tarascon, which had been lost in World War Two. 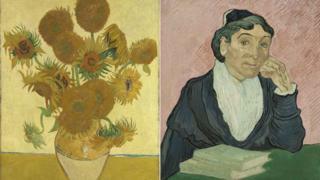 As with any collection of Van Gogh there’s a combination in the Tate show of great beauty and deep sadness.